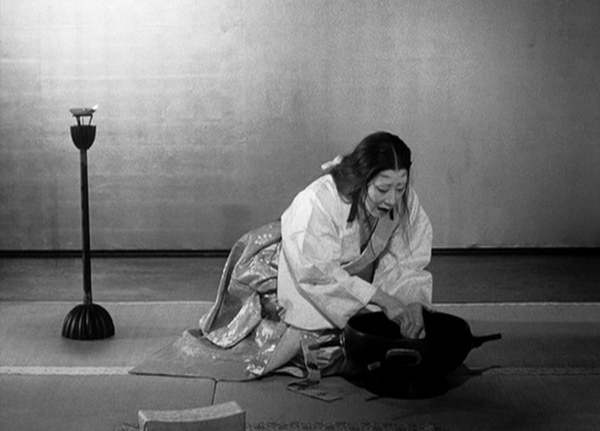 When it comes to adaptations of Macbeth, restraint is not usually part of the equation, and Kurosawa's thrilling take on the Bard's succinct, bloody tragedy is no exception. I'll let those more familiar with Japanese culture than I hold forth on the director's use of Noh drama conventions in the film. For me, the most remarkable aspect of Throne of Blood is the potency with which the director and writers convey the tragedy's distinctly Greek patrimony. I've always found one of Macbeth's most compelling themes to be the mystery of free will, a focus that marks the play as an heir to a vital Hellenistic tradition, epitomized in Sophocles' Oedipus the King. However, Shakespeare and Kurosawa probe beyond the rudimentary paradoxes that crop up wherever prophecies of doom are concerned, conveying the supremacy of our baser natures over our noblest aspirations, as well as the essential helplessness that characterizes so much of the human experience. Moreover, there's an undeniable and incredibly fruitful tension at work in Throne of Blood between the Kurosawa the tale-spinner and Kurosawa the humanist. It's clear the director has a lot of affection for the bombastic, exaggerated dimensions of the story, evident in the way Toshirô Mifune's Washizu stalks around bow-legged, stiff-spined, and eyes bulging. Or in the discordant whistle that pierces the soundtrack when Washizu learns he has been named master of the Northern Garrison. (Just! Like! The! Spirit! PREDICTED!) However, the film always retains a sense of mournfulness and desperation that gives it greater weight than that of a mere wicked fairy tale. Kurosawa and Mifune manage to make Washizu genuinely pitiable—he actually evokes a whimpering child when Miki's ghost makes its appearance—even as the man succumbs to the blackest, most putrescent excesses of hubris. And of course, there is Isuzu Yamada's turn as the terrifying Asaji, who makes Lady Macbeth seem like a quivering piker by comparison. It's not a perfect film. Too often, Kurosawa laboriously extends sequences that don't seem to warrant such treatment, as in Washizu and Miki's wanderings after their encounter with the forest spirit, or in the Lord Tzuzuki's funeral procession. Yet Throne of Blood stands out as one of the finest filmic adaptations of Shakespeare I've seen, capturing the spirit of the source material perfectly while also serving as an exceptional cinematic work in its own right.